In the United Arab Emirates, digital media content, like traditional media content, is regulated. 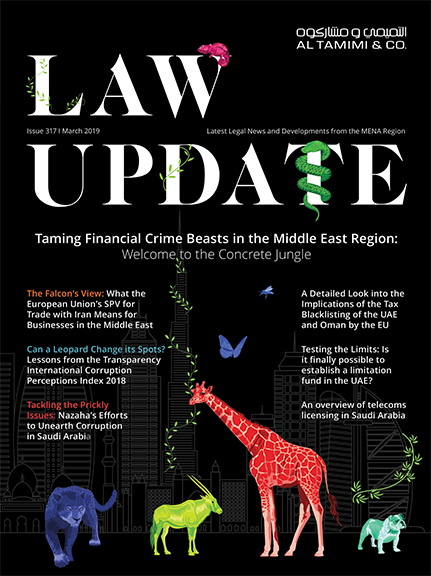 Given the pervasive nature of social media, and the substantial increase in the use of social networking sites by individuals and corporate entities in the UAE, we outline the legal landscape and some of the key issues that affect users of social media, whether in a personal or corporate capacity. The increased popularity of social networking sites (or otherwise known as “social media”) in the UAE brings with it the potential to create great economic value. The Arab Media Outlook 2011-2015 (a report presenting an overview of the regional media industry) showed that social media has grown significantly across the Arab world, with over 90 per cent of all internet users in the UAE using social networking sites like Facebook. Additionally, the frequency of use has significantly increased in the past couple of years with over 65 per cent of these users visiting social networks more than once a day. Users of social media are not limited to the “i-generation” of individual bloggers, Facebook and Twitter users. Instead, its popularity and potential audience-reach has influenced corporate entities to adopt social media as part of their day-to-day marketing campaigns. While the corporate use of social media can help boost business growth, it can also bring with it increased risks, including targeted attacks on personal information, software attacks, and risks to reputation. These concerns are not limited to corporate entities, and can also affect non-corporate entities and individual users of social media. 1. Federal Law No 15 for 1980 concerning Publications and Publishing (Publications Law) – The Publications Law governs both traditional media and digital media content. It covers all forms of published content and sets out matters that may not be published, which include matters related to religion and politics, national security, individual rights, and public morals. 2. Federal Law No 2 of 2006 on the Prevention of Information Technology Crimes (Cyber-Crime Law) – The Federal Government has also enacted the Cyber-Crime Law which prohibits any intentional act that abolishes, destroys, or reveals secrets, or that results in the republication of personal information. Social media and networking sites fall directly within the purview of the Cyber-Crime Law, which aims to deter abuses of technology. The Telecommunications Regulatory Authority (TRA),tasked with regulating digital content, prohibits activities encompassed in the Publications Law and the Cyber-Crime Law. The TRA monitors online content available to users in the UAE and prohibits content for hacking and malicious codes, internet content providing unlicensed VoIP services and other illegal internet content. Licensed service providers (e.g. Du and Etisalat) can also block online content if required and subsequent to complaints of abuse or defamation, official authorities can take legal action against those running the sites after verifying the validity and seriousness of the complaint. Once finalized and enacted, the “Media Law” that was made available for public comment in 2009 will also apply to social media and social networking sites. It has still not been finalized or enacted as at the date of writing of this article. 1. Security – It is important to be aware that the use of social media has the potential to affect the integrity of the users’ IT security. The use of social networking sites can expose the system to viruses and malware, so appropriate IT security policies should be implemented. In the context of a corporate setting, employees should be made aware of the risks of social media so that they do not disclose information that could leave the company’s IT systems vulnerable to attack. Furthermore, agreements with software vendors should be reviewed in order to make sure they are suitable for the task. 2. Privacy – The use of social media by individuals and companies also raises privacy concerns. For example, companies often use Facebook and Twitter to stay connected with clients and customers. There have been instances where the individuals responsible for these networking sites accidently post confidential or inappropriate content. It is important for companies who use this medium to monitor the content put online on their behalf, and to issue guidelines so as to ensure that such incidents do not occur. Where such services are provided by a third party service provider, a clear service agreement incorporating penalties may provide some comfort – although where the damage is reputational or involves the leakage of customer data, this comfort may be far outweighed by the damage. 3. Theft – Seemingly innocent use of social media can also expose individuals and companies to theft, corporate espionage and fraud. Several security companies in the UAE carry out “penetration tests” that are designed to test a company’s defenses against cybercrime. One example, of which we are aware, uses fake Facebook profiles to test the ability of employees to resist scams on social networking sites.) Fake social network profiles can (amongst other risks) expose users to theft of information, and this can have devastating consequences for companies that rely heavily on confidentiality for their competitive edge. Users should take care to use all social media sites conscientiously and companies should educate their employees of the potential hazards. 5. Defamation – Care must also be taken to ensure that no defamatory content is posted onto these sites because this could lead to civil or criminal liability. Such content could include posting secret information about others without their consent (even if such information is true), or posting photographs without the consent of the subject of the photograph. Posting defamatory comments about co-workers can have employment repercussions. There is scope for employers to dismiss employees for misconduct as a result of indiscreet social network postings about the employer, colleagues, or their own activities. In recent months, a number of Facebook and Twitter accounts in the UAE have been closed down by authorities subsequent to complaints of abuse and defamation. The rapid increase in the use of social media within the UAE makes it an area of growing concern and interest. Its development brings new legal challenges making it a “hot topic”. Users of social media should educate themselves in order to ensure that they are in compliance with all the relevant laws and regulations so that they may benefit by optimally harnessing the strength of this medium.